After a painfully long six months and an intense cliff hanger – AMC’s The Walking Dead returned last night and has seriously stirred up emotions in viewers. The wrath of Negan had many saddened by the deaths of not only one cast member, but two. At the end of Season 6, fans of the hit television series were expecting to see the death of a beloved character, but were not prepared to lose two. To make matters worse, the way the characters brutally died left many disheartened and in awe, as brain matter was left scattered on the concrete. After seven years of The Walking Dead, fans have grown to know and love the cast, who themselves have become like family. 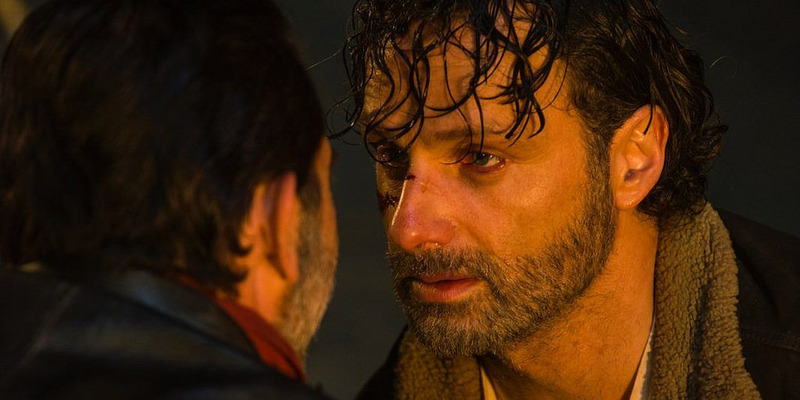 As the premiere began, directors chose not to jump into things right away, expanding the cliff hanger even more and making viewers wait until almost 20 minutes into the episode to reveal who Negan murders. First was Abraham, who made his debut on the show during the “Inmates” episode of Season 4, which aired over two years ago. Abraham may have had a short temper, but his reckless, yet wise personality, along with his man power and muscle, made him a crucial member of the crew. After his death, fans finally knew who Negan killed and had a mix of emotions, but they may have been relieved that the original cast members were still in one piece. Until Lucille, the barbed wired covered baseball bat, takes another. The second death hit home for many, as Glen gruesomely gets beaten, speaking his last words to Maggie – “I will find you,” as his left eyeball is blown out of his socket. Fans of the show have watched Glen since the very beginning of The Walking Dead, and have watched him go from the pizza-delivery boy to one of Rick’s right-hand mans. After the premiere, several of the cast members hit the stage of “The Talking Dead,” where they opened up about the loses and how it felt to keep such an enormous secret all these months. Steven Yeun, who plays Glen, was one of them and he weighed in on the devastating fate of his character – “Personally for me, I think the death in the comic, Robert wrote such a messed up but at the same time incredible way to take something away — to make a story as impactful as it is,” said Yeun, according to ew.com. Along with Yeun, cast members Andrew Lincoln (Rick), Melissa McBride (Maggie), Norman Reedus (Daryl) and Danai Gurira (Michonne) all sat on stage in front of a number of fans who gathered to view the premiere together. After such an intense episode, fans are reminded that this is only the beginning of Season 7, and that there will be an entire season of more shocking moments that are sure to tug on fans’ heartstrings. The Walking Dead airs Sunday nights at 9/8c on AMC. What do you think Season 7 will bring to the table? Do you think a third cast member will be killed? Let us know in the comments below!